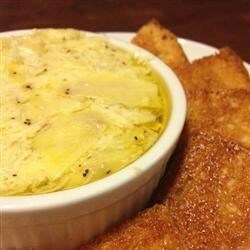 "A warm dip with Parmesan cheese, artichoke hearts and spicy green chile peppers. It's great when garnished with chopped green onions and tomatoes. Serve it with tortilla chips or pita slices. Omit the green chiles, if desired. Delicious cold, too!" In a medium bowl, mix together the artichoke hearts, mayonnaise, Parmesan cheese and chile peppers. Transfer the mixture to a 9x9 inch baking dish. Bake in the preheated oven 20 to 25 minutes, or until lightly browned. This was really YUMMY!! I also added a little garlic. Everyone loved it!! This one gets mixed reviews. I thought it was too mayonaisy for me. My dad and brother liked it but no one else ate much of it. I've had better. I'll probably keep looking. Nasty, the mayo was the taste. I was very disappointed in this recipe. It was so greasy - the oil was pooled at the top. I even cut down the amount of mayo based on an earlier review.